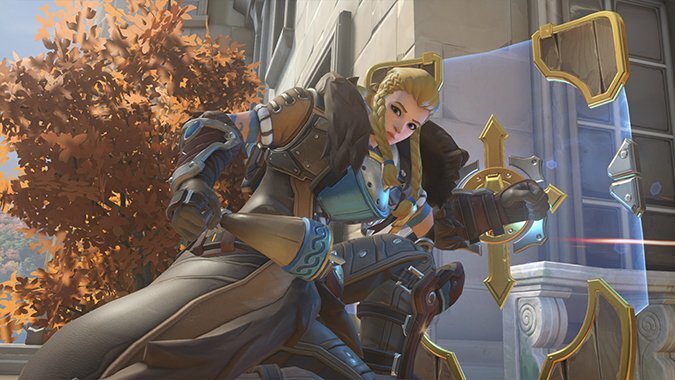 Brigitte players have the ability to fly in Overwatch using this new glitch. What started out as a strange interaction of abilities turned into something way more powerful after the community figured out how to combine it with an existing trick. For some reason, when you walk forward, use Brigitte’s Shield Bash, jump, and then use either her Whip Shot or Repair Pack (yes for some reason her heal ability works too) it sends her flying forward. This new trick allows her to move forward about twice as far as Shield Bash’s normally short distance. Reddit user tinyzenji has a good example of how this looks. You might think that the amount of abilities used and the limited horizontal movement wouldn’t end up being that useful, but this is where things get ridiculous. Ever since Moira came out, or possibly all the way back to the Genji ledge-boosting days, there’s been a physics issue in the game that allows you to soar upward after colliding with an object. Most heroes don’t have abilities that can result in this, but Moira and Brigitte can both use their small movement abilities to boost up to higher platforms. Once you combine this with the new Shield Bash and Whip Shot combo, you can now fly across the maps. We even tried it for a bit on our own stream. It’s more difficult to pull off than the horizontal movement, but it’s definitely doable. While I think the first part of this weird interaction will be fixed — Whip Shot shouldn’t cause you to rocket forward — I’m not so sure Blizzard will ever fix the object boosting. In a real game, this has pretty limited uses, but it’s way more than the hero was designed to be good at. Do you think glitches like this should be left in or should this be removed as soon as possible?